After World War II, a wave of Puerto Rican migrants settled into the Spring Garden neighborhood of Philadelphia. Much of this rapid migration can be attributed to declines in agriculture in their homeland and employment opportunities in Philadelphia's garment industry. The children of these new migrants were clustered in some of the city's public schools, where they started their own social organizations. This undated photograph shows the Club Borinquen, or Puerto Rico Club, at Benjamin Franklin High School in Spring Garden. Gentrification in the neighborhood forced many families out in later decades. 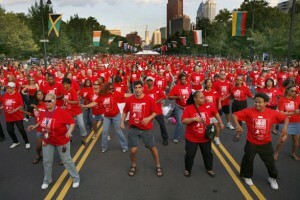 The community now revolves around Fairhill and Kensington in North Philadelphia and Camden in New Jersey. Founded in 1969, the Spanish Merchants Association provided Puerto Rican businesses with valuable services to overcome language and cultural barriers, including assisting with bookkeeping and tax returns and helping new migrants secure bank loans and mortgages. In the early 1970s, they expanded their scope, securing federal grants and contracts for a number of community infrastructure projects in the city. 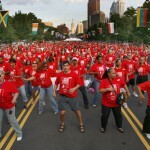 The SMA is often credited with revitalizing the Golden Block of North Philadelphia, the city's hub of Latin American businesses and cultural organizations. 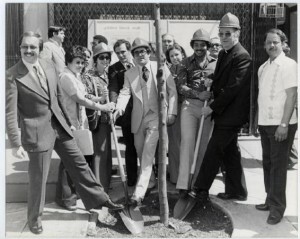 In the 1980s, the SMA shifted its focus to improving housing conditions in the city's Latin American community, opening the Section 8 housing development Dorado Village in 1983 and collaborating with the city of Philadelphia on housing rehabilitation initiatives for the area around North Fifth Street. After a series of financial difficulties, the SMA disbanded in 1988. El Bloque de Oro or The Golden Block around Fifth Street and Lehigh Avenue in Fairhill, North Philadelphia, is home to many Puerto Rican-owned businesses. In addition to restaurants and bodegas, El Bloque de Oro features some of Latino Philadelphia's most prominent cultural centers, including Taller Puertorriqueño, opened in 1974 as a silkscreen workshop. It now offers art education and after-school programs for local youth, exhibitions of Latino arts, and a bilingual book store. Centro Musical, opened in 1959 in Germantown and later moved to El Bloque de Oro, has promoted local Latino musicians since its inception as well as provided the community with the latest Latin American music releases. Beautification efforts in the area have been ongoing for decades. 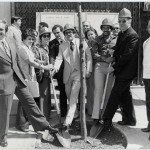 In this photo, taken in the 1970s, trees are being planted on North Fifth Street by the Spanish Merchants Association. An undulating strip of golden paint was also added to the sidewalks. In the twenty-first century, the block was given a $3.5 million dollar renovation that added large metal palm trees to the corners. The city's Mural Arts Program also provided El Bloque with colorful murals celebrating the Latino community. 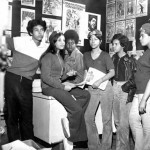 While most closely associated with New York and Chicago, Philadelphia hosted a branch of the Young Lords Party in the 1970s. Modeled after the Black Panther Party, the Young Lords Party was a Puerto Rican activist group involved in national politics. 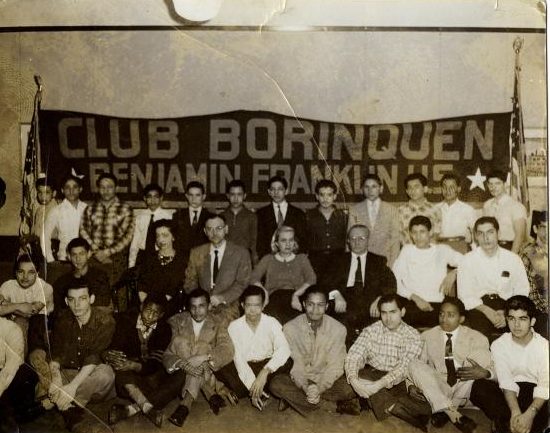 Locally, the group sought improved education for Latino youth, fair housing, and access to day care, as well as promoting Puerto Rican independence from the United States. 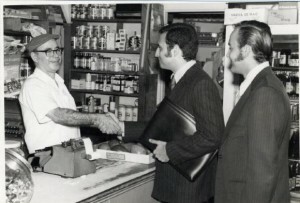 The Philadelphia branch of the organization was one of several community groups providing important services to the city's growing Puerto Rican population. Puerto Ricans migrated to the Philadelphia area in search of better economic opportunities. A small stream of migration prior to the twentieth century grew during the two world wars, with many more migrants arriving from the 1950s onward. Many families settled permanently in the region, where their lives intertwined with black and white residents and their labor supported the agricultural and manufacturing sectors. Small pockets of Puerto Rican settlement existed in Philadelphia in the late nineteenth and early twentieth centuries. Long-standing business relationships between the island and city merchants, especially in the sugar trade, provided personal contacts and direct transportation routes. Itinerant cigar makers, railroad workers, and a smaller number of students and professionals also reached the city, aided by informal networks of family and friends. Some early migrants used Philadelphia as a base for revolutionary political critiques of Spain. They joined Cubans, Mexicans, and Spaniards to form a pan-Latino enclave of perhaps 1,500 persons by 1900. Proximity to jobs along the docks, at Baldwin Locomotive Works, and in cigar factories drew Puerto Rican migrants to three primary areas: Southwark, Spring Garden, and Northern Liberties. In these multiethnic neighborhoods, Puerto Ricans mixed not only with other Spanish speakers, but also Italian, Polish, Jewish, and African American neighbors. The region’s Puerto Rican population grew quickly due to regional labor shortages during World War I, with many new arrivals to Philadelphia moving into subdivided housing stock or boarding houses. As their numbers grew, Spanish-speaking residents founded institutions including a mutual aid society, La Milagrosa Catholic Chapel, and the First Spanish Baptist Church. Staff at the International Institute (later Nationalities Service Center) also facilitated gatherings. 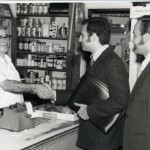 Alongside small businesses like bodegas, these institutions supported a Spanish-speaking community that served as a nucleus for later waves of Puerto Rican migrants. In Southern New Jersey, farmers began to hire Puerto Rican workers as early as the 1920s, and a Puerto Rican enclave emerged around Linden Street in Camden. After the Great Depression, Puerto Rican government officials increasingly encouraged migration off the island, partly to address their perception that overpopulation exceeded economic resources. Officials facilitated employment contracts, arranged air transportation, and oversaw workers through regional offices. From the early 1940s to the early 1960s, tens of thousands of Puerto Ricans became seasonal workers in New Jersey and Pennsylvania. Migrants typically came from rural island areas, where they had worked in agricultural processing of sugar, coffee, or tobacco, produced home needlework, or operated light machinery. Upon arrival in the mid-Atlantic region, the majority started out on farms, while others worked for food canning companies or railroads. As U.S. citizens, Puerto Rican contract workers were not subject to deportation, and many chose to remain stateside. Some Puerto Rican women migrated to join a family member that was already established stateside, while others traveled on their own employment contracts. Finding low wages and poor housing conditions, many migrants left agricultural work relatively quickly in favor of manufacturing or service positions. Some of the population departing from the region’s farms headed to Philadelphia and Camden, while others joined the hundreds of thousands of Puerto Ricans in New York City, small settlements in the Lehigh Valley, or returned to the island. Meanwhile, the predominantly rural and agricultural island of Puerto Rico quickly industrialized, as a massive internal migration brought families from rural areas to cities. Finding far too few jobs for the many workers displaced by declines in agriculture and home needlework, growing numbers of Puerto Ricans left the island in search of employment. Philadelphia attracted approximately twelve thousand Puerto Rican migrants during the 1950s and soon hosted the third-largest concentration of Puerto Ricans in the continental United States, while Camden drew an additional six thousand migrants. Many moved to the cities in search of manufacturing jobs. The biggest draw was the garment industry in North Philadelphia and Kensington. Others found openings at shipyards or Camden’s Campbell Soup factory. Puerto Ricans also commonly worked in restaurants, hotels, cleaning, and maintenance. 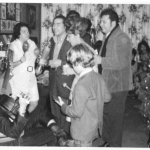 By the 1950s and 1960s, Puerto Rican migrants to Philadelphia settled primarily in the Spring Garden neighborhood and along a north-south corridor surrounding North Fifth Street. Many of their neighbors were African American families with southern roots. The clustering of Puerto Rican-owned businesses around Fifth Street and Lehigh Avenue developed into the “Golden Block” (El Bloque de Oro) retail area. Pressured by gentrification of neighborhoods close to Center City, some Puerto Rican families later settled farther north, toward Hunting Park. Others moved into West Kensington, where they sometimes faced racial violence and intimidation from remaining white residents. Across the river, Puerto Rican settlement gradually progressed into South Camden, creating friction with remaining Italian neighbors. In their interactions with other city residents, Puerto Rican migrants encountered discrimination and confusion. Philadelphia officials took greater notice of the new arrivals in the mid-1950s, after white residents attacked Puerto Ricans outside a bar in Spring Garden. The Commission on Human Relations undertook studies in 1954, 1959, and 1964 to gather information on how to speed Puerto Ricans’ assimilation. Existing institutions such as Friends Neighborhood Guild, Nationalities Service Center, and branches of the Young Women’s Christian Association sought to improve services to the community. The Catholic Archdioceses also sought to reach Puerto Ricans, opening Casa del Carmen in North Philadelphia and posting a Spanish-speaking priest at Our Lady of Fatima in South Camden, which was in the process of transitioning from an Italian into a Puerto Rican parish. 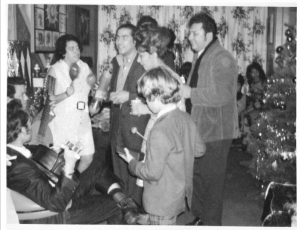 Meanwhile, Puerto Ricans founded their own hometown clubs and other groups, some of which united under umbrella Concilio organizations in both Philadelphia and Camden. They also made Puerto Rican culture more visible, beginning annual Puerto Rican Day celebrations in Philadelphia and Saint John the Baptist parades in Camden. From the 1970s forward, migration from the island continued to the region even as it declined to other destinations. Local populations also grew through natural increase. By 1973, Philadelphia and Camden had an estimated 85,000 and 13,000 Puerto Ricans residents, respectively. Many families moved between the mid-Atlantic region and the island as employment and personal circumstances changed; it was not uncommon for children to attend schools in both places. The majority of Puerto Ricans still held blue-collar jobs, with about 20 percent gaining white-collar employment. 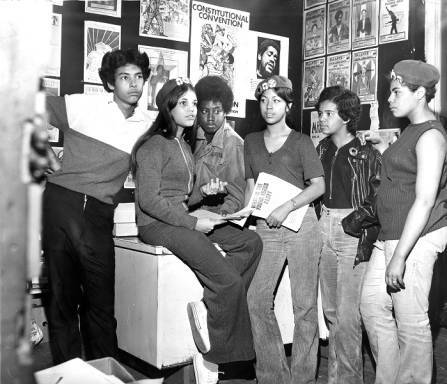 The growing population took advantage of the Young Lords Party’s community programs, Aspira’s educational enrichment, and Taller Puertorriqueño’s artistic offerings in Philadelphia, while Puerto Rican Unity for Progress bolstered social services in Camden. In the latter decades of the twentieth century, Puerto Rican residents faced greater challenges in securing stable employment as the region deindustrialized. Neighborhood infrastructure and public services suffered from disinvestment. Nonprofit organizations including El Congreso de Latinos Unidos and Asociación Puertorriqueños en Marcha engaged in community development to address some of these needs in North Philadelphia, while the Puerto Rican Alliance helped channel the community’s growing political power. In Camden, the Latin American Economic Development Association (LAEDA) formed to assist small business owners. In both cities, Puerto Rican residents were particularly visible in calling attention to poor housing conditions and police brutality, at times cooperating with African American neighbors in their activism. Beginning in the 1980s, the community’s growing political power helped elect Puerto Ricans to Philadelphia City Council and the Pennsylvania legislature. Puerto Ricans remained the largest and most politically visible Latino group in the region, but they were increasingly joined by migrants from Mexico, the Dominican Republic, and Colombia. These groups occupied their own residential enclaves and economic niches while sometimes mixing with Puerto Ricans in established Spanish-speaking organizations. By 2010, approximately 122,000 Puerto Ricans lived in Philadelphia and an additional 24,000 in Camden. Philadelphia’s population had grown sufficiently to overtake Chicago as the second-largest mainland concentration, behind only New York City. More recent economic troubles on the island spurred additional migration to the mid-Atlantic region. Overall, Puerto Rican migration to Philadelphia has been a reflection of economic circumstances. Workers who found an inadequate labor market on the island were attracted to opportunities in agriculture, manufacturing, and service in the mid-Atlantic region. Upon arrival, migrants provided the region with much-needed labor, but also faced challenges due to widespread discrimination and the decline of industrial employment. Still, many persevered and built a strong network of community resources within an increasingly diverse region. Alyssa Ribeiro is an Assistant Professor of History at Allegheny College. Her research has examined relations between Puerto Rican and African American residents in postwar Philadelphia. Arnau, Ariel. “The Evolution of Leadership within the Puerto Rican Community in Philadelphia.” Pennsylvania Magazine of History and Biography 136, no. 1 (2012): 53-81. González, Juan D. “The Turbulent Progress of Puerto Ricans in Philadelphia.” Centro 2, no. 2 (1987-88): 35-41. Gillette, Howard. Camden after the Fall: Decline and Renewal in a Post-Industrial City. Philadelphia: University of Pennsylvania Press, 2005. Jones, Isham B. “The Puerto Rican in New Jersey: His Present Status.” Newark: New Jersey State Department of Education, Division against Discrimination, July 1955. Kimmel, Michael. “¡You’ve Come a Long Way, Bebé!” Philadelphia Magazine, October 1971. Koss, Joan Dee. “Puerto Ricans in Philadelphia: Migration and Accommodation.” PhD diss., University of Pennsylvania, 1965. Siegel, Arthur, Harold Orlans, and Loyal Greer. “Puerto Ricans in Philadelphia: A Study of Their Demographic Characteristics, Problems and Attitudes.” Philadelphia: Commission on Human Relations, April 1954. Stinson Fernández, John H. “Conceptualizing Culture and Ethnicity: Toward an Anthropology of Puerto Rican Philadelphia.” PhD diss., Temple University, 1994. Vázquez-Hernández, Víctor. 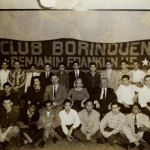 “From Pan-Latino Enclaves to a Community: Puerto Ricans in Philadelphia, 1910-2000.” In The Puerto Rican Diaspora: Historical Perspectives, edited by Víctor Vázquez-Hernández and Carmen Teresa Whalen, 88-105. Philadelphia: Temple University Press, 2005. Whalen, Carmen Teresa. From Puerto Rico to Philadelphia: Puerto Rican Workers and Postwar Economies. Philadelphia: Temple University Press, 2001. Nationalities Service Center Records, Special Collections Research Center, Temple University Libraries, 1210 Polett Walk, Philadelphia. Council of Spanish Speaking Organizations (El Concilio) Records, Historical Society of Pennsylvania, 1300 Locust Street, Philadelphia. Taller Puertorriqueño, 2721 N. Fifth Street and 2557 N. Fifth Street, Philadelphia. El Centro de Oro / The “Golden Block,” centered on N. Fifth Street at Lehigh Avenue, Philadelphia.